When it comes to shopping for modern lighting, we’re betting that many customers are overwhelmed simply by the massive number of lighting options and styles out there. Being able to distinguish the difference between different light bulbs and their ratings can help you as a crafty homeowner to outfit your home with the best home lighting available. Plus, it can be handy to impress your friends! Those looking for the top lighting showroom in Michigan will not be disappointed by the Shelby Design Center. Our lighting company in Shelby Township provides all of the design options and advice you need to take on any lighting project. Today, we’ll continue our look into light bulbs by discussing the science and differences between watts and lumens. When you’re ready to put all of this information to the test, be sure to stop by our lighting store to check it out! As incandescent bulbs begin to fade out, the outdated watts system is going out with it. Our society is going through a big change, creating confusion amongst consumers. It’s important to know the difference between these two rating systems to ensure the best outcome for your home! This measurement actually tallies up how much energy an item uses, not how bright it is. Up until recently, our society relied on highly-similar incandescent bulbs, all of which utilized the same system to create light. In essence, a higher wattage in your bulb equated to a brighter light. 50-watt light bulbs were roughly half as bright as 100-watt options and so on. Modern science has made it so that the wattage rating of a rating is not a determining factor into how bright the bulb actually is. Modern lighting has necessitated the need for a better system of measuring the actual brightness of a light bulb. Being able to measure the amount of light emitted is much more accurate and useful for determining exactly how bright a room will be. In its most basic form, one lumen equates to the amount of light emitted by one candle that is one foot away. To give you an idea of how this translates, a standard 100-watt light bulb generally produces about 1600 lumens of light. While the brightness of your light bulb is important, it is also very important to find a system that uses this number to determine energy efficiency. To start, it’s important to find the light bulbs for your home based on how many lumens you are hoping to acquire. Once this is accomplished, you can begin to search for a bulb that provides the most energy efficient. Luminous efficacy is the measure of how well a bulb can produce light, calculating the result to a lumens-per-watt rating. Your average incandescent bulb, for example, produces 850 lumens at the cost of 60 watts. This comes to 14 lumens per watt, which is not very efficient. Based on an energy cost of 11 cents per kilowatt-hour, one bulb will cost you about 165 dollars over the course of 25,000 hours. When you factor in the fact that incandescents last about 1,000 hours, the cost will include the theoretical replacement of 25 bulbs. A 13-watt CFL bulb, on the other hand, produces roughly 800 lumens at a fraction of the energy cost. Your average CFL will fall around 62 lumens per watt, offering more than four times the illumination. Over a 25,000 hour usage, the total cost for this bulb assuming the previous rules comes out to just over $35, requiring a quarter as much energy. While the number differences may not seem important up front, the long-term energy and financial savings can add up immensely. 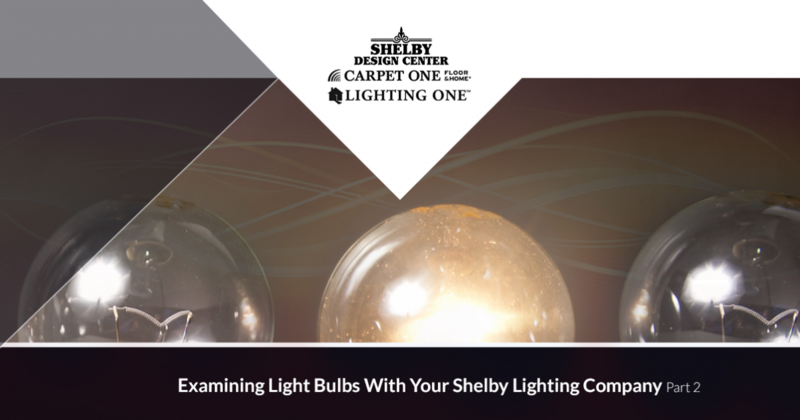 Finding the perfect mixture for your home can be a challenge, but now you will arrive at the lighting showroom equipped with more knowledge to communicate your plans with the friendly staff here at the Shelby Design Center. Our experienced team is here to provide all of the help you need to illuminate your property perfectly. Our lighting company in Shelby is a co-op member as well, giving our customers more inventory at more affordable prices. When you are considering updating your home lighting, make sure to stop by for help. Contact us today or stop by our showroom to see the quality difference!